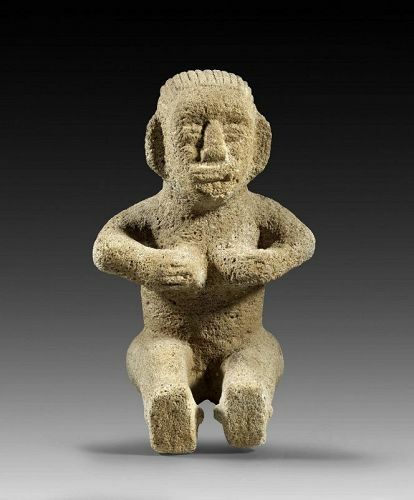 Rare Aztec Volcanic stone (lava) figure of a Kneeling Godess! Pre-Columbian, Mexico, Aztec Empire, ca. 1400 to 1521 BC. Carved from a single piece of volcanic basalt, this column-shaped figure is kneeling, and it's depicting a female goddess. The figure has wide open eyes and wears a huge multi-tiered headdress going down on the back. A very attractive figure! Condition: Choice, completely intact and unrepaired. 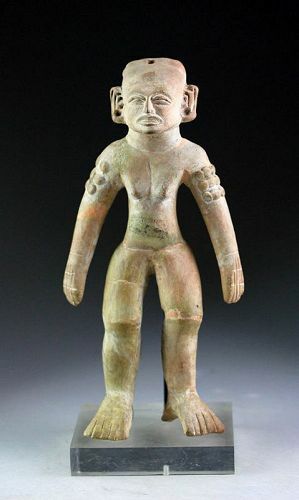 High Quality Pre-Columbian Mexico Vera Cruz Pottery figure! 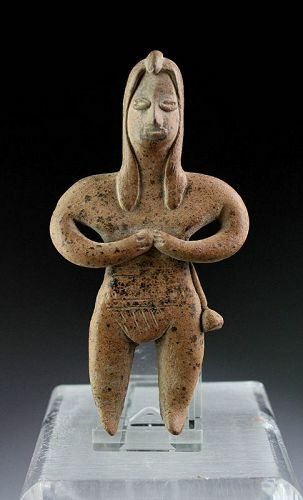 A rare and very high quality pottery figure of a male, Pre-Columbian Mexico, Veracruz culture, ca. 6th to 8th century AD. An incredible large pottery figure of a naked man with strangely curved large feet and fine facial features. Sometinmg on his upperarms, which might be tatoos. A fine sculptural Pestle with a bird, Costa Rica, Atlantic Watershed zone ca. 800 to 1300 AD. A large and massive Pestle, possible for ritual use with a mortar, carved with a full body of a bird, with folded wings and head and beak turned down. It looks most like the local Toucan with it's very large head and massive beak, but could be a Macaw perhaps or even an eagle depicted here. Size: 15,5 cm. high and 7 cm. wide weighing ca. 770 grams. Exceptional Double Chambered Peruvian Vicús pottery vessel! A fine Vicus Figural Vessel, c. 100 BC - 300 AD. The double vessel with bridge handle, a monkey on one side and spout on the other, the designs in black negative resist paint. Rare Vicus (Moche) Peruvian Stirrup vessel, 100 BC-300 AD! 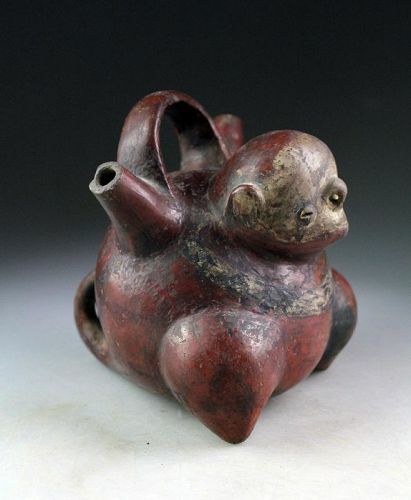 A good size important Pre-columbian vessel of Monkey form, Peru, Vicús Culture, comtemporary with early Moche 1st.-3rd. century AD. A tall vessel with a wide fluted body and high foot and with a modeled Jaguar-head. Guanacaste, 1000 - 1500 A.D. Size: ca. 29 cm. tall and massive! Condition: Exceptional, intact with fully preserved pigments and fine colour. 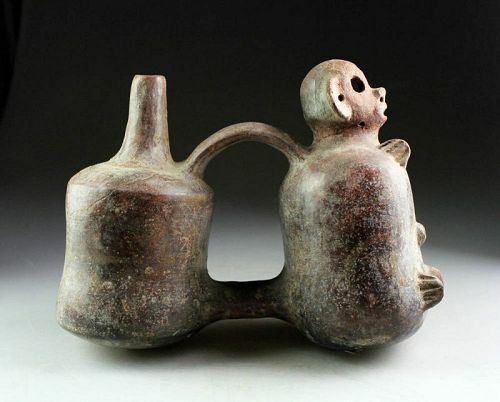 Rare Monkey form Stirrup vessel from the Vicús / Moche Culture! A good size important Pre-columbian vessel of Monkey form, Peru, Vicús Culture, comporary with early Moche 1st.-3rd. century AD.